Why has it become so popular and what are its intercultural differences? The term “Work-life balance” has become very popular over the past decades due to several reasons. The enduring trend towards globalization causes the environment to get more complex and even more fast-paced. Intrinsically linked to that is the change of society which exposes employees to an increasingly amount of stress. Moreover, the demographic change and business pressure to be the “employer of choice” in order to attract a decreasing number of skilled workforce cause companies all around the world to offer Work-life balance policies that aim at supporting their employees in creating a healthy and productive balance between their working and private life. Moreover, certain differences between cultures in terms of the employees’ Work-life balances and the employers’ approaches to it can be noticed. As this dissertation concentrated on the differences between the U.S. and German culture, it compared a questionnaire filled out by an American employee working for an American national cable television company to a pilot study of German companies. Differences were discovered in the attitude towards the Work- life balance of the leadership within a company. Also, the offerings of sport- and leisure facilities differed as well as family-friendly policies. Finally, the dissertation came to the conclusion that Work-life balance policies have to be customised to the respective culture of the employees in order to be really efficient. As a result of the global financial crisis numerous countries, especially in the European Union, have passed several essential cost-cutting programmes in order to decrease their sky- high budget deficits. For example, Great Britain has passed the UK’s biggest spending cuts in decades in October 2010. Massive decreases in welfare, councils and police budgets are supposed to save as much as £81 billion over the next couple of years. Hence, almost 500,000 public sector jobs could get cut in the upcoming five years (BBC News, 2010). As a result from this approach towards saving, the remaining employees in UK’s public sector are urged to fulfil more tasks faster and with fewer resources. In addition, not only public sector employees already have to deal with the enduring trend towards globalization that causes the working environment to get more complex and even more fast-paced but also employees of the private sector. Studies have shown that employees in both sectors will likely experience severe difficulties of creating a healthy and productive balance between their working life and family life as they are not only expected to be well educated staff member but also be exemplary parents in their leisure time and above all, have a fulfilling personal life. In a study which was conducted by Johnson, Lero and Rooney in 2001, employees from 220 Canadian companies were asked about the topics of work, family and health. Thereby 73% of the participating employees indicated that the stress caused by the work is correlated to a non existing balance between work and life. In the year 1989 the response to the same question was only 58% (Johnson, Lero and Rooney, 2001). However, this issue is not only omnipresent in North America. For instance, a study conducted by the Techniker health insurance indicates to what extent Germany is affected by stress, depression and burnout. According to the study, eight out of ten Germans perceive their life as too stressful. Furthermore, the study also indicates that the job is the main cause for stress. Driven by hecticness, deadline pressure and too much workload, many employees end up with a burnout (Der Spiegel, 2011). This is a crucial fact for companies as for example German companies lose 22 billion per year due to absenteeism of their employees. Furthermore, this number tends to increase as the days of illness that are caused by the Burnout steadily increase (Der Spiegel, 2011). This trend is pictured in the following figure which outlines the massive increase of days of illness in Germany between 2004 and 2009 due to the burnout. Source: Adapted from Spiegel.de Owing to the facts and statistics that are mentioned earlier, one can assume a negative development. In addition, surveys that were undertaken by the World Health Organization point out how devastating this development is. Already, the WHO has declared job related stress to be one of the most important dangers of the 21.century. According to the WHO,depression will be the most important disease in industrial countries by 2030 (Der Spiegel, 2011). Against the background of the negative development mentioned above, the concept of Worklife balance has not only gained on importance but has also evolved in the past decades and thus, is on everyone’s lips. When someone googles the term Work-life balance he will get approximately 5,200,000 responses which shows the popularity of the subject. Moreover, the following quote points out the importance of Work-life balance. This quote indicates that there is a general fear amongst graduates that the family foundation, the maintenance of existing friendships, the own hobbies and leisure time activities such as the regeneration of their own power reserves are incompatible with the future job. Thus, the competition for key personnel is becoming very tough due to the added factor. Work-life balance has become a strategic topic for many companies (Rump, 2009). In recent times, many personnel managers try to convince potential employees by offering, for instance telework, sabbaticals or other methods that intend to give staff members more control about their own time. However, the question of what has lead to such a notably increase over the past decades in the strong longing for a healthy and productive Work-life balance remains. Has the entire world and especially the working world changed so much that this longing is the logical change to the development or is the Western civilisation just moaning about their inability of efficient time management? In contrast, especially the Asian population, which is well known to live in a very hard working society, does not seem to bother their lifestyle. Do these facts imply a difference in the Work-life balance of people from different cultural backgrounds? Deriving from this context, this dissertation follows several objectives. To begin with, it intends to understand what motivates companies to offer Work-life balance measures and will therefore address the research question: Why do companies decide to put an increasing effort in providing Work-life balance measures for their employees? 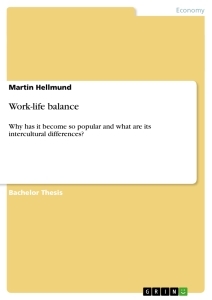 Second, the dissertation sets out to put the significance of Work-life balance for companies in an international context and will therefore focus on determine potential cultural differences of employees’ Work-life balances. Thus, the research objective shall be reached by answering the following research question: What cultural differences exist in employees’ Work-life balances and their employers’ approaches to it? In order to reduce the complexity of this topic, the focus will heavily be laid upon a comparison between the German and the U.S. culture. To come to a good conclusion, this thesis will compare the provision of Work-life balance policies of an American national cable television company to German companies. Furthermore, due to the complexity of the topic, the dissertation will avoid to distinguish between male and female employees. For simplification, the thesis will just refer to an employee which includes both genders. After the introduction to the subject, the dissertation will then continue with a literature review. Here, next to a brief history of the term Work-life balance, the literature review will also define the discussed term and give an overview about existing literature that address the reasons of its popularity as well as its cultural differences. After the literature review, the dissertation will continue to inform about the methodology used in this research. Moreover, it will provide useful information about the research design, data collection, reliability and validity and finally, the data analysis. Afterwards, the Findings will reveal the results from the questionnaire, which was filled out by an U.S. employee working for an American national cable television company and the German pilot study. Then, the next chapter “Analysis” will examine the reason for the increasing popularity of Work-life balance and will also compare and interpret the questionnaire and pilot study findings. The last part of the dissertation will draw conclusions upon the conducted research, will give recommendations and will also provide information about the future research. This dissertation has two intended uses. First, it will provide good conclusions that could be adapted in Human Resource departments of companies. Therefore, HR managers are able to adapt these findings to a certain extent within their own organisations. Second, as this dissertation can be counted as being a small-scale study, other authors are able to do some follow-up research with it in order to take the findings forward and come up with more reliable conclusions. The following chapter discusses the development of research on the subject of Work-life balance. Due to the popularity of the topic there is a huge body of literature on this subject. Also, many authors have tried to reveal the reason for its increasing popularity since understanding the reasons for the Work-life balance evolvement is of great significance for companies in order to adopt the right approaches. First, a brief history and overview of the different definitions of the term Work-life balance will be provided. Second, existing literature about the reasons for its popularity will be discussed and finally, the dissertation takes a critical look into the existing literature about cultural Work-life balance differences. To begin with, the term Work-life balance fulfils many criteria in order to be a popular catchphrase: Everybody seems to know about what is meant and even more important, almost everybody is seeking Work-life balance. This might be one reason why the overall number of publications has massively increased over the past years (Resch, 2003). One of the authors focusing on the historical development of Work-life balance is M.Resch. In 2003 she wrote the book Work-Life Balance - neue Wege der Vereinbarkeit von Berufs- und Privatleben? (Work Life Balance - new ways for the compatibility of private and working life?) in which she describes the development of the subject. She mentions that the discussion about Work- life balance has had a long history as it is linked to the general discussion about the healthy balance between the working life and the rest of an employee’s life and hence, has evolved out of the overall research about profession and life. Whereas in previous decades the concentration has focused on mothers or the compatibility of an occupation connected to the duty of caring for young children, nowadays the focus has shifted towards the interaction of different areas of work and life of both, women and men, in order to create a family-friendly situation amongst employees. This focus change is intrinsically linked to the fact that the first wave of offered Work-life balance programs within companies were primarily set up to support women with children, whereas today’s programs are less gender-specific (Resch, 2003). Furthermore, according to Lockwood (2003) the term Work-life balance was coined in 1986, despite its usage in everyday language was scattered for several years. However, in 1977 Rosabeth Moss Kanter’s seminal book, Work and Family in the United States: A Critical review and Agenda for research and Policy, made the topic of Work-life balance to the focus of research and organizations (Lockwood, 2003). Yet interestingly, organizations developed certain programs that aimed at optimizing the balance between their employees’ work and life as early as the 1930’s. For instance, the W.K. Kellogg Company replaced the traditional three daily eight-hour shifts with four six-hour shifts just before World War II. As a result, the new shifts increased the employee’s morale and efficiency. Nevertheless, the majority of companies began to offer Work-life programs not until the 1980s and 1990s (Lockwood, 2003). the past years and many authors have tried to define the term Work-life balance. Therefore, the following table shows a brief summary of some definitions. Next, an even more diversified meaning has the word “life” in the whole issue surrounding Work-life balance. Many authors define life as the antithesis of work, meaning non-work. Finally, when it comes down to defining the term “balance”, several things have to be taken into account. To begin with, “balance” usually refers to some sense of equity or reasonableness. For instance, workaholics are believed to be unbalanced because they do not really conform to anticipated norms about where and how they invest their time and energy. Yet, reasonableness is very much in the eye of the observer as a workaholic can still be more fulfilled than a more laid-back counterpart who has hardly any passionate interests. such as family members or close friends. Career versus family. How far does female cultural development influence German-Swedish cooperations in project management and which values are behind it?